Bleach is a great sterilizer, but be sure you don’t mix it with other cleaning chemicals. (Bloomberg photo by Daniel Acker). 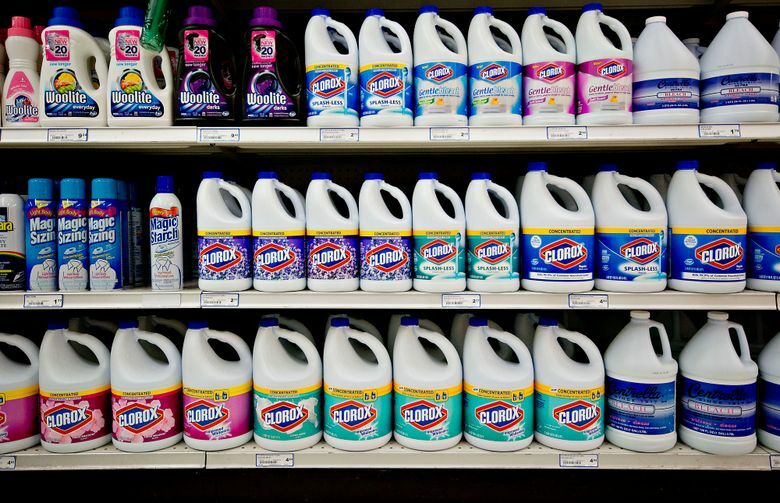 Is household bleach a wonder product or a hazardous chemical? An expert weighs in. There is dissension in laundry rooms and grocery store cleaning aisles everywhere. For some of us, when it comes to whitening and disinfecting laundry and certain areas of our home, common household bleach is a wonder product. To others, bleach is a hazardous chemical. To get to the hard truth about chlorine bleach, I turned to the experts. Here is what I learned. But more alarming than a possible laundry mishap would be mixing bleach with other household cleaners, especially toilet bowl cleaners and ammonia. Such a reaction would result in the release of chlorine gas, an asphyxiant, which can prove fatal if it comes in contact with your eyes or lungs. Benzoni says any cleaner should be allowed to dry completely before applying a bleach solution. This will help to minimize the chance for exposure to a potentially toxic reaction. When used properly (it should always be diluted with water before use), chlorine bleach is safe for disinfecting surfaces. It kills harmful germs and bacteria and sanitizes clothes in the laundry. “Bleach is like the sun in its ability to sterilize,” Benzoni says, “but it is not a cleaner.” Bleach rapidly loses activity in the presence of dirt, so you first need to remove the dirt so that it can disinfect. This means that you should not be relying on those handy bleach-imbued wipes to both clean and disinfect; clean first, then disinfect. The same is true for products such as Clorox Clean-Up Cleaner + Bleach; make sure you remove any apparent or excess dirt before using. To clean and disinfect a surface, you first need to wash it with soap and water to remove dirt and debris, let it dry, then treat it with diluted bleach — at most 1.5 cups bleach per gallon of water, Benzoni advises. After applying bleach, let the area sit for about 10 minutes, then wipe it with clean water. He also recommends that you wear gloves when using bleach and ventilate the area as much as possible because bleach solutions can irritate your eyes, skin and respiratory tract. Mary Gagliardi, Clorox’s in-house cleaning and laundry expert, says some people are uncomfortable using bleach because they’ve had a bad experience with white spots, but she says that if you follow the directions, bleach will sanitize and whiten your bleach-safe laundry. She says you might not notice a difference when you wash a new item, but over time, clothing, sheets and towels can start to look dingy — an outcome that bleach can prevent. What’s safe to bleach and what’s not? Gagliardi says to never use bleach when washing spandex, wool, silk, mohair or leather — regardless of their color, bleach will ruin them. So always check your clothing labels. As for colored fabrics, some are colorfast to bleach; it depends on what dye was used to color the fabric and how it was applied. Gagliardi says you can’t know just by looking at the fabric, so test it first: Add 2 teaspoons regular bleach to a quarter-cup water and apply a drop to a hidden part of the item. Wait a minute, then rinse and blot dry. If there is no color change, you can safely launder the item with bleach. “You need to adjust the amount of bleach you add along with your detergent, based on the size of your load and the soil level,” Gagliardi says. Add a half-cup for a normal load with an average soil level, and 1 cup for an extra-large and/or heavily soiled load. To wash sheets, Gagliardi says, select the heavy-duty cycle and hot water temperature, use a good-quality detergent, and then add a half-cup bleach. It’s a myth that bleach damages fabrics (at least any more than regular machine washing with detergent and tumble-drying does). “We’ve looked at this extensively examining a wide variety of typical items you would find in a bleach load (including T-shirts, socks, underwear, sheets, and dish towels); after 50 wash and tumble dry cycles, we found no significant difference in fabric strength between laundry washed in detergent alone and laundry washed using detergent and bleach,” Gagliardi wrote in an email. Gagliardi shares one of her favorite uses for bleach: Add a quarter-teaspoon bleach to a quart of water in a vase, then add flowers. The bleach will fight bacterial growth and keep the flowers fresh.